I guess because Ironsally’s a journalist she got an invite to some fancy ball in Stormwind. Kind of a Foreign Correspondents Ball or something. She wanted my help putting something together to wear, although I don’t know why I bothered cause she didn’t listen to me. I guess because of the whole Ironman thing she really doesn’t understand the concept of stats real well, as she never had any. She insisted on that dagger for the look and I told her people would laugh at her carrying a weapon with agility. She assured me that no one would dare laugh at a warlock so I let it go. I guess she forgot about the gardening outfit and I didn’t want to remind her. I really put my foot down on the cleavage though. We finally came to a compromise, if she insisted on wearing her Corsair’s Overshirt she had to wear a hat that balanced it out. I think we did well, I don’t think she’ll have any trouble with anyone addressing her chest rather than her face at the ball. Hope she has fun and leaves the demons at home. So yeah … I’m just goofing off. 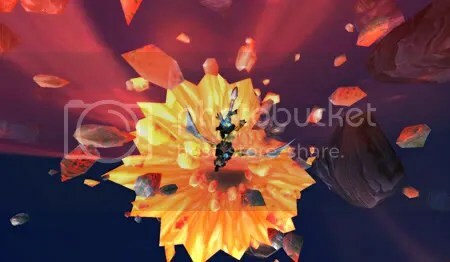 I was reading Navi’s post about her guild’s heroic raiding being dead and I was thinking, yeah, that’s how I feel a little, of course without the whole raiding thing. My version of raiding would be to open up the Firelands vendors on a couple more alts and try to get to 50 exalted. And I’m just not doing it. Not going to happen, sorry girls. Instead I’m doing stuff like this. Feeling low on self esteem? Had a bad day? If you’re exalted with the Kirin Tor you’re in luck! Run in and out of Krasus Landing repeatedly and you’ll feel much better. Such lovely compliments. And if you’re really feeling down do it while eating a Chocolate Cookie, guaranteed to lift anyone’s spirits! Well, you really didn’t think I was going to let it go with just one video and one screen shot did you? Here we are in beautiful Nagrand. Me showing the bird the time period he was SUPPOSED TO DROP for me. Oh well, all is forgiven now. 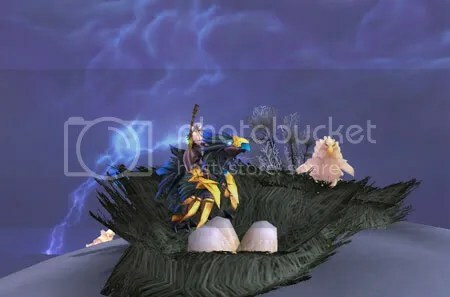 Didn’t stay long in Storm Peaks as the Stormcrest Eagle eagle looked rather upset with us. So I’m not sure I’m going to get to any of the things on my bucket list. I feel like I’m on summer break. I guess it’s a pre-expansion summer break mood I’m in. I think it’s likely that I’ll be goofing off, wandering around, looking for things like this until the Pandaren arrive. School’s out. It’s the lull before the Panda, I’m going to enjoy it. What does that have to do with Real ID? Nothing, I just thought I’d show you how ridiculous a computer addiction can get, I’ll get to Real ID in a minute. The heat pump repairman has come and gone. I was hoping that he could just top off the refrigerant or something, no but, the compressor’s gone so he’ll have to come back … sometime. So short of dragging this computer and all it’s accompanying parts and bits downstairs, this is what I’ve come up with. Kind of a swamp cooler. Homemade. I feel a lovely cool breeze, really. It’s all in belief, you have to believe. Anyway, most people may not have this Real ID problem, but if you’re shy or an introvert you may have it too. Having not been in a guild most of my WoW career I’m not used to having people there to talk to and I always get in predicaments because I’m really not sure of the etiquette, there must be some. Shy people can be difficult to deal with, I’m one and so is my husband. For example, you login and see I’m on. I don’t say anything, not a word. What the hell is up with that? You thought we were buddies, what’s up? What’s up is a shy person thinks, oh, I don’t want to bother them. They are probably talking to other people, I don’t want to interrupt. Sigh. The only way my husband and I got together was we worked in the same cubicle for three years and I was devious and told him I was moving to Florida. Yes, I had to resort to trickery to get a proposal. So yeah, I’m not proud of it but these shy people can be difficult to deal with sometimes, they need a little push. My real problem is I worry about not answering. I mean if you’re in an instance, old DBM handles all that, but if your level 67 No Death Ironman gets jumped by three mobs, what’s the correct etiquette there. Common sense says just respond after it’s safe but I have a hard time doing that, it seems so rude. The other day my Hunter was picking flowers, and then I had to watch her almost get beaten to death by a waspy thing and two crocolisks as I couldn’t bear not answering right away. Her pet had done one of those appear with almost no health thingys and didn’t survive long enough to help her. And I really get all flustered when I’m having two or three conversations simultaneously. It’s so bad I sometimes tell one friend, OMG, I’m trying to talk to two people at once, OMG! He’s very nice and stops chatting to relieve the stress, what a nut. Me, not him. The worse time was when there were about five people on and I was afraid to go downstairs to get a drink because they might say something and I’d be ignoring them. It seemed like overkill to type brb to five people I wasn’t talking to at that moment just in case … but I thought about it. I sort of do the same thing irl as I madly flail my arms about at every passing car, dump truck, whatever, on the dog walk. Don’t want anyone to feel ignored. Geez, and now I just realized I do the same thing here. I am incapable of not responding to every comment individually and immediately, wow, this problem runs deeper than even I had suspected. I guess I’ll get the hang of it. Or maybe not, I still seem to play with the assumption that the harder I hit the keys the more it hurts the mob. I know, logic just doesn’t seem to come into it. 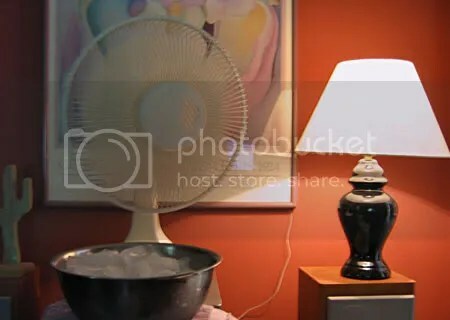 It’s feeling like Heat Stroke Level Four in here so I’m off to get some more ice for my homemade air conditioning unit. My playing time has been severely curtailed. Actually doing ANYTHING on the computer. First it was birthday celebrations, but the real culprit is something else. 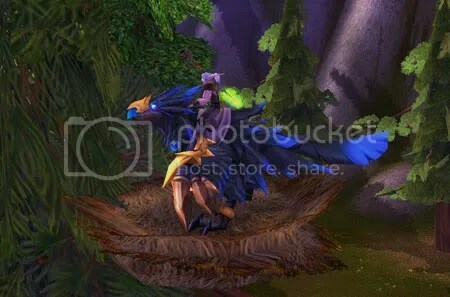 I did login yesterday long enough to do the really important things like find nests for my Raven Lord to try out. WHAT! That is important! 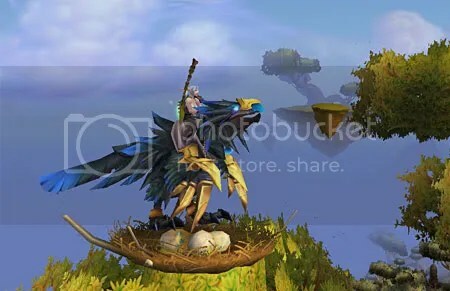 It was Cymre’s idea and a good one, next I’ve got to see if there are any suitable nests in Nagrand maybe, worth looking into. So anyway my problem is that the upstairs heat pump decided to die. It’s a holiday weekend, and a hot one, so getting a repair person right away was not an option. So I’m a big wuss and can only take the heat up here in short bits and then I have to run downstairs to recover. I’m also afraid the computer will burn up in this heat. Repair man can’t come until tomorrow. While playing irl I did do one thing that sort of reminded me of how I play WoW. I had to go to the store to pick up birthday napkins. It was really hot and I caught a whiff of a smell that reminded me of the boardwalk at the beach. Kind of a french fries with vinegar smell. It felt kind of holidayish and made me think of ferris wheels and carnival rides. Next stop, gas. My husband saw a notice that said you’d get 20 cents a gallon off, if you bought a car wash with a fill-up. My car was dirty and I love the car wash. It’s a little building that you drive into and it always reminds me of a ride at a carnival. So yesterday we drove the car into the little building, got festive multi-colored foam sprayed down on us and then giant jets of water that made a noise like we were about to be sucked into a jet engine. Then the big mechanical thing is behind you and stops. It lingers a minute before it ominously starts back towards you, building drama I guess, and then it comes at you with the blowers. The whole thing was really fun and if you can’t make it to the boardwalk or a carnival, I’d definitely recommend it as a kind of alternative amusement ride. It reminded me of alternative leveling, just you know irl. So tomorrow I’ll get kind of a server restart when the heat pump man comes, whew, it’s even on the right day of the week! Or Geek Pride Day should be made a universal holiday! Luckiest day ever. I’m pretty sure this video will be watched hundreds of times … by me. Not that interesting if you’re not me but I just had to commemorate the event. I did not see this coming. I didn’t think that the Prairie Dog would turn out to be the lucky talisman that would finally, finally, win me The Reins of the Raven Lord but it did. But you know now that I think about it, it probably wasn’t the prairie dog at all! It was my new avatar. I think that’s it! I mean I did this for years and the day I get a beautiful new avatar it drops? Kind of suspicious don’t you think? Maybe it’s a magical avatar! Maybe Vidyala puts a little magical something in them, might be worth looking into. Anzu, 158th kill. I’ll kind of miss him. I had even started looting without paying attention, thought I had another Boomstick. So here’s me running around on my bird with musical accompaniment. 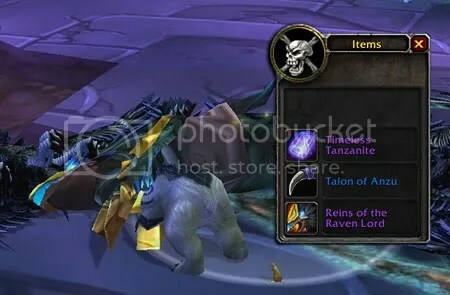 Had to go to Shattrath City and tell my homies I finally got him, just a few years late. All the NPCs seemed suitably impressed. Man, I don’t know what to do to follow that up, fishing? I don’t know, maybe I’ll just ride around some more. Through some serendipitous celestial event, some fortuitous alignment of the stars, everything just came together this morning. 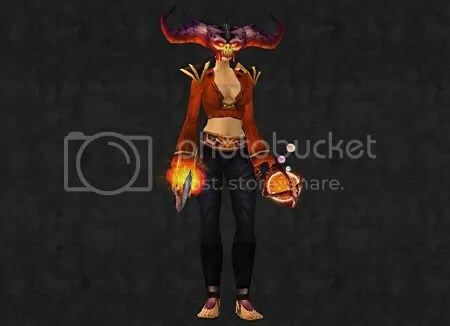 Yes, I will no longer be representing myself to the world (of WoW) as a generic kitty. 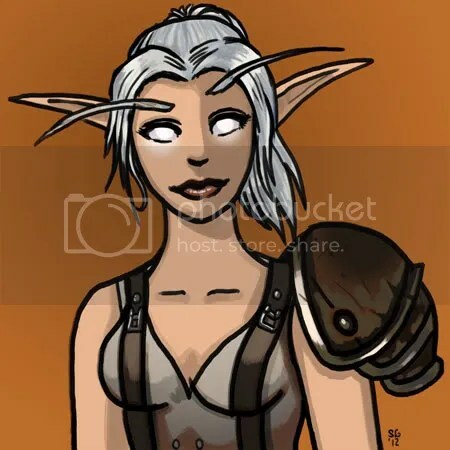 Thanks to coming second in Kamalia’s Great Blog Noblegarden Egg Hunt 3.0 I now have a beautiful new avatar created by the lovely and talented Vidyala of Manalicious and From Draenor With Love. Cat is just thrilled and she’s been running around Stormwind showing it to everyone. Then I visited Navimie and found her 25 May is Geek Pride Day post and a chance to redeem myself. She said Cyrme had found a second nerd test! This is it! A second chance to make up for that 71 score because of the stupid math and on Geek Pride Day too! Oh the pressure! Thankfully the fact that I used to watch shows with talking cars finally paid off. I just knew that’d come in handy one day! So I am proudly a Cool Nerd Queen on the day I get a new avatar AND just in time to honor Geek Pride Day, although I really thought I’d do better on dorkiness but you can’t have everything. In game I’ve decided to stop fooling around and get serious about my bucket list. I finally got my poor Shaman, who has been sitting at 84 1/2, to 85. She was somewhat annoyed that I haven’t updated her clothes since level 80. She thinks Ironsally had a negative influence on me and she could be right. I do seem to have developed a rather cavalier attitude toward gear, I should really at least make her something to wear now that she’s 85. And now, Hunter, get ready. We WILL have the Vial of the Sands before Mists arrives, we MUST find the recipe, MUST! So yeah, that’s what I’ll be doing, serious digging. But first I must change into my new avatar so I can see how I look! Exciting! And I even remembered to get pine nuts so I can make Kamalia’s Cornmeal & Pine Nut-Crusted Fresh-Caught Fish for dinner! Yay for Geek Pride Day! Faced with the loss of my computer I decided to do something useful. My plans were to trim the overgrown Mountain Laurel in the yard. I hadn’t expected to encounter adventure here irl but find it I did. Wow, I kinda sound like Yoda, find it I did. Anyway, when tromping through the side yard I sensed movement. Yikes! What? Snakes? I’m scared of snakes. Again, something’s moving. YES! There it is! A what? 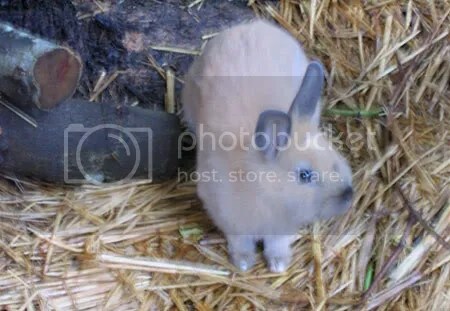 A … bunny. Yeah, he looks all cute and innocent but he’s a devil. I didn’t know that you can’t capture a bunny but I soon found that out. Our next door neighbor’s daughter recently turned seventeen. She wanted a bunny for her birthday. Her mother went to the local shelter and they had two bedraggled bunnies so she took both. One then gave birth and she had four bunnies. So, four bunnies next door. The neighbors aren’t at home and at least one has escaped. I checked and this one, thankfully, was the only one who’d escaped. Now I’d held these bunnies so I thought it would “know” me. Maybe it did and he’s just a sadistic bastar bunny, but he’d let me get right up to him and then spring away, just out of reach. Then he would lie down. ON HIS SIDE. MOCKING ME. Since the coming of the bunnies the fox traffic in our yards has increased tremendously. I had to get that bunny, no eaten bunnies on my watch. CURSE YOU BUNNY! I’m trying to help. This went on for about an hour. I finally managed to build a sort of chute with tarps and herded it into the tunnel back to safety. Whew. After that I kinda just said screw it about trimming the shrubbery. So anyway, my point is who knew adventure was waiting right here in the real world! So, what else did I do on my vacation irl. Oh yeah, this is cool. I was fumbling around on my husband’s computer, I fumble around cause all his computer wants to do is music and video. It’s an audiophile computer, real snobby. Sennheiser headphones. Doesn’t want to look at cool stuff, sheesh. But I forced the issue and found out My Nerd Score is 71. I’m a mid-rank nerd. Good to know. So that’s what I did on my mini-vacation irl. Had thrilling bunny adventure, found out my rank as a nerd. Didn’t trim bushes. Frankly, I’m exhausted. I’m going to login and do something soothing and peaceful like archeology or fishing. Got to come down off this high from my real life adventuring, really, who knew. I am bereft. My computer is gone, I don’t know when it will come home. From the description I gave the wizard I took it to for repair, he seemed to sense a hard drive failure was possible. I want it back. Why has the wizard not called. Sigh. So anyway I found some random picture and thought I’d try to communicate here since this Mac won’t let me comment on so many blogs as far as I’ve been able to tell. To Matty I said Blizzard should have an asshat meter and once you went over a certain level of asshatery you would become targetable and your raid could solve you as a problem by killing you, seems only fair. To Navimie I commented that I loved that video and thanked her cause so far about all I’ve been able to do successfully is watch videos on this MACHINE. So I don’t know why this computer won’t just give up with the being difficult as I’m very stubborn and I WILL COMMUNICATE one way or the other. I can not play the games. No games. No games. OMG! Help me Mr. Computer Wizard, I can’t last long like this! I’ll have no option but to CLEAN! And this Mac clearly doesn’t like me and won’t let me comment where I want to. THE HORROR! Maybe it’s Safari, maybe this computer needs Firefox, I’ll try that next, I’m sure my husband won’t mind me screwing around with his computer, surely not. The wizard has had my baby for 3 1/2 hours. Do you think it’s too soon to call him? Yeah, I was afraid of that. Don’t want to annoy him. So anyway, I just wanted to say that even if I can’t comment I can assure you I’m lurking at your blogs with this reticent Mac, counting the hours until I can talk freely again and make some more gold, and you know, save the world generally. And oh yeah … work.